trying to copy a folder into a open phpstorm project doesnt work, and if you autogenerate something, for example a symfony bundle, then it doesnt show up either, and the "Syncronize" button does nothing. 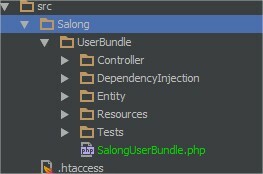 Note the "BeautyBundle" is missing from the structure inside of phpstorm. It created the folder "BeautyBundle" but does not paste the files or anything under it. It also is invisible in the project structure. In all of this the "Syncronize" button does nothing, the only way to get everything to show is to re-open the project- which is a MAJOR hassle- especially if you have a ton of assets that are added regularly. It's the same when you auto-generate stuff as well, if you create a new symfony bundle, composer project, add any file of any kind to your project then you have to restart the IDE to see the files.